5 Tips For Coupon Shopping Online! 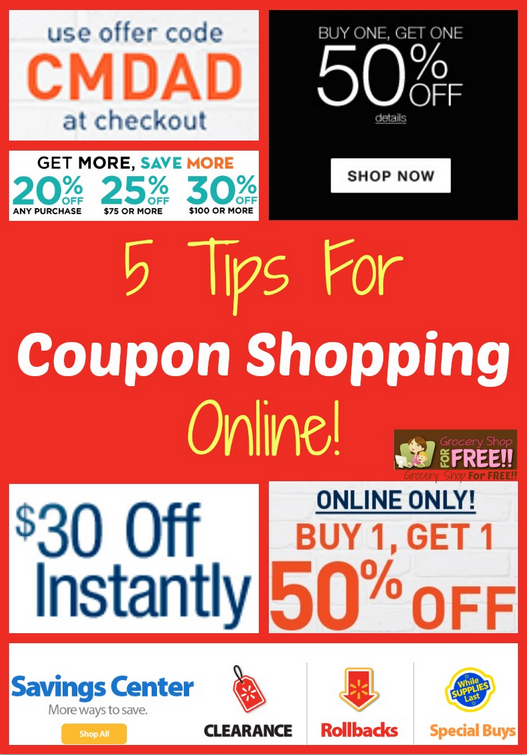 You are here: Home / Finance / Couponing / 5 Tips For Coupon Shopping Online! Most of us shop with coupons in stores, but, I want to share 5 tips for Coupon Shopping Online. As the years go by more and more of our shopping seems to be online. Sometimes the best deals are found online with so many ways to save. Many stores have coupon codes we can use and even stack to get better deals. I always make sure to check the clearance section online and switch the view to Low to High. Most online stores have the view set High to Low or New Items and those are going to be more expensive. Why would you pay more than necessary? With a rebate site they give you discounts, coupon codes AND a rebate! Can’t beat that! I LOVE Mr. Rebates! I told y’all about that site a while back and often remind you about using their site. Remember, just for signing up with Mr. Rebates you get $5 in your account FREE to start off and you can cash your account out at just $10! So, you can shop all year and make cash back and use that for Christmas Shopping! It’s a win-win! You can find coupon codes for everything, and you should NEVER shop online without them! You can get codes to lower the cost of a particular item, or to lower the cost of an entire transaction or for FREE Shipping! Always do an internet search for a coupon code before you make a purchase online. You know what stacking is, we do it all the time at other stores (using more than 1 coupon, or in this case coupon code, on an item or purchase), it applies to online shopping as well. If you find a $10 off $20 code, see if you can find a FREE Shipping code, too and see if they will allow you to “stack” those codes together for an even better deal! Same as the tip above if you purchase something with a code for $10 off $20 and can have your purchase shipped to the store and pick it up yourself – you’ve got FREE shipping, too! Say you purchase something for $30 and have a $5 off $30 coupon code – that makes your cost $25. But say there’s another coupon code for $30 off $50 – that would make a $50 purchase just $20, so it makes more sense for you to keep shopping! Get your order up to $50 and use the $30 off $50 – you end up paying less than you would with the other code and getting another $20 worth of merchandise essentially for FREE! So, be smart and think it all through before you hit the purchase button! Those are few tips to help you with your online shopping, as always if you have a tip to share feel free to comment and tell us and if you have a questions, feel free to comment and ask! Also, at least for larger online purchases, using the live online chat at the store website might net you a discount. We purchased a generator this weekend from Home Depot. My husband had some questions and I pushed him onto the live chat to get answers. The customer service rep ended up offering him a 10% discount and free shipping if he purchased the generator that day – which we were planning to do anyway! Since the generator cost over $1,000, this was a HUGE savings! @Ellen: That’s awesome! What a great savings! I never thought about live chat giving a discount, too! This is all excellent advice. Thanks for linking up today! @Shelly @ Coupon Teacher: Thanks! Thanks for the linky! Those are great ideas! I do more of my Christmas shopping online than ever before as well and these tips will come in handy. @Leslie: You’re very welcome and thanks for the kind words! Great tips! Shopping year round really helps my Christmas budget. I like to take advantage of all of the great deals throughout the year. I really like shopping online too. I use eBates the most for online shopping rebates. And I always look for free shipping. Sometimes shipping just kills the deal! @Renae @ Madame Deals: Absolutely, I hate to see FREE stuff with a HUGE shipping charge – That’s not FREE at all!